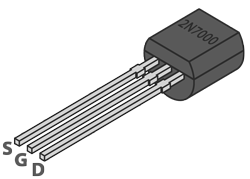 The 2N7000 is a handy N-channel MOSFET capable of continuously driving up to 200mA. The 2N7000 works well as a gate driver for larger MOSFETs that require a higher gate threshold voltage but that you want to control with a smaller voltage such as 5V or 3.3V. This Mosfet is really easy to use as a switch when working with and Arduino (or any 5 volt logic for that matter). It also, based on my measurements, should have no problem being driven to full saturation by 3.3v logic (like the Raspberry Pi). I will be using these to implement a two stage Mosfet setup. This coupled with the IRF9540N that Addicore sells will let me switch on and off 23 amps with my Pi Zero.